In order to grow crops, the soil needs to have adequate amounts of nutrients and moisture to foster plant growth and health. Plants extract nutrients that they need from the soil and sun, and the nutrients are then returned to the soil when plants die and decay. When growing food the cycle is broken because we remove the crops that were grown and the nutrients that plants have absorbed are not returned to the soil. Gradually most nutrients are lost, crops become smaller, and the land less productive. To keep land productive, nutrients must be replaced. These nutrients are typically replaced artificially by using commercial fertilizer. Animal dung or human feces and urine can be used, though animal dung does not replace as many of the lost nutrients as human fertilizer. Consequently, this makes human fertilizer more valuable. Chemical fertilizers are available for purchase that will replace some of the lost nutrients, but they are very harsh on the soil, kill the microbes and worms, and must be purchased every year. If cost to purchase the fertilizer is beyond the means of the farmer the soil will continue to deteriorate year after year. Up to 60% of the crop yield is dependent on the soil fertility. In addition, the artificial fertilizer must be purchased, which can be a major financial burden in many communities. If unable to purchase fertilizer, the land will continue to deteriorate and become less productive year after year. Plants need a variety of nutrients to grow. Three of these nutrients are called macronutrients and they are Nitrogen (N), Phosphorus (P), and Potassium (K). Most of the fertilizer used is to replace the macronutrients. An additional ten nutrients are called micronutrients and are required in smaller amounts for healthy plant growth. The required micronutrients includes: Sulfur (S), Magnesium (Mg), Calcium (Ca), Iron (Fe), Manganese (Mn), Boron (B), Chlorine (Cl), Zinc (Zn), Copper (Cu), and Molybdenum (Mo). The micronutrients, also called trace elements, are usually available in adequate quantities in healthy soil. This is soil that has a healthy mixture of microbes, worms, and organic material. Healthy soil is created when pathogen-free feces are tilled into the soil. In the following paragraphs I will focus on macronutrients. Nitrogen (N) is the most important for above-ground (stems & leaves) plant health. It is a macronutrient and is part of nitrate, ammonia, and organic nitrogen. The plants absorb the nitrogen compounds through their roots where it travels to the leaves and help with converting sunlight to nutrients. In addition, microorganisms take the ammonia, from nitrogen, and convert it to nitrites for use by the plants. This process requires healthy soil with an abundance of microorganisms. Plants absorb the nitrates, nitrites, and the other forms of nitrogen in the soil. Adequate nitrogen leads to green foliage, vigor, and plant growth. Nitrogen is a key part of the chlorophyll molecule that leaves use to perform photosynthesis, absorbing sunlight to create the plant’s own food. With too much nitrogen, plants will have long, stringy, weak stalks which will additionally attract insects that can destroy the plant. With too little nitrogen, plant leaves will yellow and stop growing. Nitrogen helps in the building of protein, photosynthesis, fruit quality, and disease reduction. It is present in soil, but not bio-available (i.e., created by plants) and needs to be added to soil. Phosphorus (P) works by moving energy from one point in the plant to another. It is responsible for good root growth, fruit, and flower development. Phosphorus also helps to improve the plants hardiness, hence protect the plant from disease. Deficiencies in phosphorus can be observed with dull green leaves and purplish stems, and a generally unhealthy appearance. If plants appear healthy, but there are no flowers or fruit, this can also be an indication of inadequate phosphorus. It is the scarcest of the three macronutrients and almost always needs to be added to the soil, essentially at the roots as it will not travel downward in the soil. It is involved in the creation of sugars and starches. It encourages blooming and plant growth. Once added, it is relatively stable. If it is deficient the plant may take the phosphorus from older parts of the plants so the deficiency may not become apparent until it is too late to correct. Potassium (K) is essential for strong plants. Along with Nitrogen it is a key in converting sunlight into plant nutrients. K is noted as a catalyst in the conversion of numerous key biochemical reactions in plants. It helps stress tolerance and will also help protect plants from disease. Potassium improves drought tolerance. You can think of it as helping to raise the quality of fruit/produce produced. It helps regulate plant metabolism and acts as a supporting player which makes it more difficult to spot when deficient. Leaves may look discolored and blotchy with a general malaise when there is inadequate K. Phosphorus is a key part of plant DNA, the genetic code that defines all living things. It is also a component of RNA, the part that reads the DNA genetic code that defines the plant and how it is to be built and the seed yield and genetic transfer. Potassium’s can activate at least 80 enzymes. The enzymes regulate the rates to reaction from major plant growth stimuli. Potassium also influences water-use efficiency. 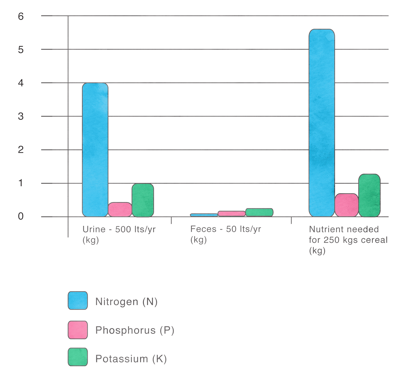 Total nutrients that are secreted by an adult per year in feces and urine are estimated to be: 4.55kg of Nitrogen, 0.58kg Phosphorus, and 1.27kg of Potassium. The nutrient content can vary greatly depending on the nutrient intake. The higher the nutrient intake the higher the nutrient value of the feces and urine. In a given year, a family of four can produce the equivalent of around 30 kg of N–P–K. One person can provide enough nutrients for 200m² to 400m² of crop growing area. The crop growing area estimate varies depending on soil quality and quality of the urine and feces. There are two distinct fertilizer products that are produced when we sanitize urine and feces. The feces and urine are separated at time of going to the toilet (using a UDDT) and are treated separately. They are also used as fertilizer separately. Urine is most responsible for supplying the macronutrients and is quickly available for use on plants. Feces take longer to sanitize and provide some macro nutrients, but more importantly, they assist in creating healthy soil where micro-organisms can thrive and produce micro-nutrients. This is soil conditioning, where a product (feces) is tilled into soil to improve the soil’s physical qualities, especially its ability to provide nutrition for plants and retain moisture. Healthy soil will promote microorganisms, worms, and healthy microbes that help produce the micronutrients that plants require. Healthy soil will also retain water so the need to water the plants is reduced. Healthy soil will have a distinct darker color. Urine has the greatest benefit as a fertilizer. The majority of the macro-nutrients the plant needs are in urine and in a proportion that is beneficial to the plants. It is easy to collect because all you have to do is urinate into a container where the urine will be stored until needed. Urine is free from pathogens so it can be put into the soil around plants without fear of spreading diseases or worms. Being liquid it is easy to insert into the soil around the plants where it is absorbed. The nutrients (N,P,K) are also in a form that are easily absorbed by the plant roots. The average person discharges about 550 kg of urine annually. The urine needs to be captured at time of urination in a sealed container. To help control odors, urine should go down a tube or pipe that enters the container at the bottom. In addition, it is recommended that all urine capturing devises use traps, figure 4.1, to prevent odors. Urine is sterile in healthy individuals and, even when some pathogens are present, it is usually in very small amounts. The main health concern is inadvertent cross contamination from feces mixing with urine when using the toilet. Everyone who will be using the UDDT needs to be properly trained on how to use it so the user does not mix any feces with urine. It is recommended that a poster be posted on the toilet wall to show how to properly use a UDDT, figure 4.2. The poster should be posted in a prominent location in the UDDT so anyone unfamiliar with using a UDDT will understand the proper operation and not create any cross pollution. Conversely, it is also important to post a poster that shows what not to do so figure 4.3 should also be posted. It is recommended that a week’s worth of urine be collected in a closed container and then stored for at least an additional week before using as a fertilizer. By the end of the week any stray pathogens in urine will have been killed by the ammonia, carbon dioxide, and the higher PH levels that are created. In addition, if urine can be exposed to the sun where it is heated and exposed to ultraviolet rays, this will provide further assurance that any remaining pathogens have been destroyed. Do not dilute the urine during storage. The average person will urinate about 1.2kg per day. The concentration of nutrients can vary, but estimated amounts are that—in one year—urine will contain about 3.5kg of nitrogen (N), 0.4kg of phosphorus (P), and about 1.0kg of potassium (K). If the nitrogen level is unknown use a default concentration of 3 – 7 grams per liter of urine.1 Daily, 10-12 grams of nitrogen, 2g of phosphorus and 3g of potassium are excreted and 80% of the N and K and 50% of the P are in urine while the remaining is in the feces.2 Dilution is not necessary when applying to soil though some documents recommend diluting by 50% or more to help control odors. The amount of nutrients varies from researcher to researcher depending on whose urine is being tested. The variety and concentrations of nutrients can also vary by the various types of food eaten. The amount of water drunk can also greatly affect the concentration level in the urine. The deeper the yellow color of the urine the higher the concentration of nutrients. ·	Nitrogen (N) The ammonia portion of the urine will readily evaporate if left in an open container or on top of the soil. That is why the container needs to be sealed and urine inserted directly into the ground. Smelling the urine means that you are losing some of the fertilizer to evaporation. Ammonia is what typically gives the urine its distinctive foul odor. 50% of the ammonia and 30% of the organic nitrogen will be absorbed by the plants. Nitrogen is readily soluble in water and can be available later. This also means that Nitrogen absorbed by the water can be washed away if too much water is used on the plants. ·	Potassium (K) is another macronutrient that is supplied to plants by soil minerals, organic materials, and fertilizer. The K form in urine is readily absorbed by the plants. Being that the fertilizer is urine, care should be taken when applying so none gets on the plant. ·	Phosphorus (P) often comes from commercial fertilizer, so careful handling of the urine should be exercised so none of the nutrients are lost since no commercial fertilizer will be used.